The 2013 National Healthcare Leadership Compensation Survey, conducted by INTEGRATED Healthcare Strategies and co-sponsored by ASHHRA (the American Society for Healthcare Human Resources Administration), was recently published, with a record number of 1,350 participating healthcare organizations. The 2013 data on salary structures, bonus plans, budgeted increases, benefit plans, is now available. “Healthcare organizations have almost no margin for error when it comes to budgets, and it is only getting tougher in 2014,” Kevin Talbot, senior vice president & practice leader for INTEGRATED. Data was summarized for 175 executive level and 39 manager level positions, representing more than 26,000 incumbents. 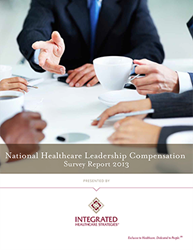 The data compiled for the National Healthcare Leadership Compensation Survey is effective February 1, 2013. Year-over-year trends represent changes from February 1, 2012 (the effective date of the previous survey) to February 2013. The median salary increase over the previous 12 months for the majority of both system and hospital positions ranged from 2.0% to 4.0%. Projected increases reported for the upcoming fiscal year for all executives are 3.0%. Approximately 80% of systems and hospitals have a short-term, or annual, incentive plan in place, while long-term incentive plans are typically only found at larger, complex organizations. CEOs have a total incentive opportunity as high as 80% to 100% or more of salary at target value, if they are eligible for both short- and long-term incentives. Median base salary for independent system CEOs is now $750,000. In addition to detailed summaries of incentive opportunity levels by position, the survey also offers descriptive statistics regarding executive benefits, supplemental benefits and common perquisites. With compensation and budgets continuing to be a challenge, especially with declining reimbursements a stark reality for many organizations, this is a topic that isn’t going away in healthcare. INTEGRATED has experts and primary research data to share with industry media. Please contact Christy Boswell, survey manager, at Christy(dot)boswell(at)ihstrategies(dot)com if you’re in need of an expert or data to help complete a story. For more than 30 years, INTEGRATED Healthcare Strategies has provided consultative services and people-based solutions to clients across the healthcare spectrum, including community and children’s hospitals, academic medical centers, health networks, clinics, and assisted-care providers. Our expert consultants and nationally recognized thought-leaders help organizations achieve their business goals by ensuring top talent is attracted, retained, and engaged, while measuring and maximizing human and organizational performance. With tailored solutions that extend well beyond single services, INTEGRATED offers the knowledge, guidance, insights, and alignment that organizations need to not only survive the rapidly changing healthcare environment, but to succeed in it. Exclusive to Healthcare, Dedicated to People℠.